That’s not saying you shouldn’t or can’t- but this kind of movie really is not something I generally get behind. God’s Not Dead is about a college student with high academic goals being faced with a crisis of faith- having to prove the existence of God or else fail his Philosophy class. I have worked with college students who have had professors challenge their faith (at best) and tear it down (at worst). So the movie has a very viable story line. I’ve read some good things that the cast is good (a positive movement in Christian movies), and that the production value is good (also a positive when it comes to a Christian movie). Here is why I don’t particularly like/enjoy/advocate movies like this (I could list several, but want to focus on one)- they often simplify life and tell the viewer how to think or believe. They get preachy. The “Christian movies” that I’ve seen often do not encourage critical thinking about faith, life, beauty, doubt, and our existence. This is why I’m excited about the NOAH movie. I want to see Darren Aronofsky’s interpretation of the Biblical story (which is very short and lacking a lot details- which presents itself well for a movie interpretation) and see how Aronofsky understands the story. Movies like this (or The Matrix, LOTR Trilogy, Doubt, Inception, Looper and the list can go on) open themselves up for conversations about God, faith, life, grace, and redemption without being preachy- and open up those conversations with those who will never step into the theater to see God’s Not Dead- or even to one of our churches. This creates an intersection of culture and life where the truth of God can become a natural part of our daily conversations. Here is an article about the Noah movie wondering if evangelicals will miss the boat on this movie! I’ll be seeing Noah on April 6th with students from Wesley College- and afterwards discussing the movie over pizza. I’ll be post here about that experience. Did you see God’s Not Dead? What did you think? Did it encourage your faith? 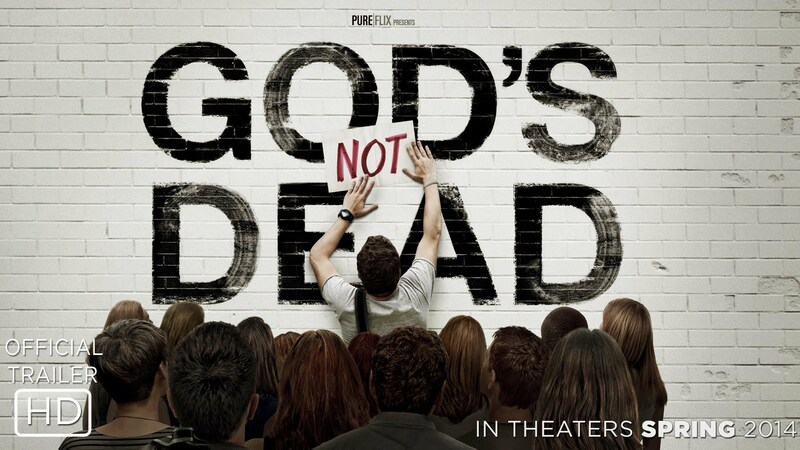 Would a non-Christian come out of that movie convinced that God’s Not Dead? Are you going to see Noah? FWIW- the fact that the Newsboys are in this is detrimental to my opinion. I was a Newsboys fan in the 90’s until John James left the band. I cannot listen to the boys from down under now that Michael Tait is the lead singer. I saw this movie last night. This movie was absolutely incredible and it’s a life changing movie. I do not agree with some of your sayings on Christian movies on how they try to make you think, because that definitely did not happen. I encourage this movie for any believer and non believer because it is so beneficial for both types of people. It strengthened my faith and it has a powerful message. It doesn’t force anything on anybody it just shoes a story and uses many different types of people that makes it easy to affect all viewers. Go see the movie and then rewrite this article I promise it’s worth every penny. Blake- thanks for the reply. I am happy that the movie strengthened your faith. You’re right that it may be beneficial to a non-believer. My concern is that many “Christian” movies targeted towards Christians do not appeal to non-Christians. A movie like “Noah” that has broad appeal (warts and all) creates a common starting point for dialogue about faith and about the Biblical text and what it means. Thanks for stopping by and chiming in!